According to the CIA World Factbook, Ukraine produced 25% of all agricultural output in the former Soviet Union. 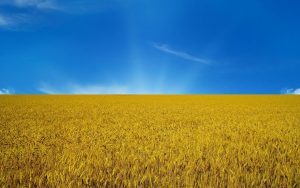 Today, Ukraine exports internationally substantial amounts of grains, rapeseeds, vegetables, sugar, sunflower oil, milk poweder and meat. Agricultural exports (including non-food exports) go to Russia, 20%; the countries of the European Union, 17%; China, 7%; Turkey, 6%; and the U.S. 4%. In addition, food processing, especially sugar and oil processing, is an important segment of the Ukraine’s economy. Nearly one out of four workers in Ukraine is employed in agriculture or forestry – quite an impressive figure for a 50-million population of the largest European country. According to experts, only 45 to 50% of Ukraine’s arable land resources are used today for crops cultivation while the number of cattle and poltry has decreased in the past decade despite the growing demand for food in the World. Many associate this disbalance with the moratorium on the sale of arable lands in Ukraine. Private farming is based soleley on land rental contracts noramally ranging from 5 to 15 years and sometimes goint to 25 or even maximum allowed 49 years rent. The status of Ukraine as a Bread Basket of Europe will certainly be proofed very soon after the moratorium is terminated. In the meantime, Ukrainian business elite has been concentrating on the more lucrative and faster profiting steel production which has fallen amid the financial crisis by 38% while agricultural output is not likely to be affected due to never dropping demand for food.